Map : potorment_2.txt "P 655.9699, -514.6332, -223.9979, 127, 0, 0, 1, Avatar_of_Anguish"
This page last modified 2011-09-30 07:58:33. Casts Black Symbol of Anguish (http://everquest.allakhazam.com/db/spell.html?spell=1154). I dont kill, cause i only need one Orb. I cleared the entire area where this thing spawns 6 times. No show at all. The avatar of Agony was already up when i got to him. The other 2 avatars i needed to clear the area's where they spawn at twice. This is just ridiculous. EDIT: 9 clearings later and still no show. I waited to see if the named would spawn before i logged but of course it did not. EDIT: I cleared the area 4 times and it finally showed up on what is now the 5th and final clearing so i don't have to deal with this bs anymore. i've been camping this mob for over 2 weeks now, and still, it never spawns. starting to tihnk it's a myth that sony made up. anyone have an idea of what the timer is, or a way to get him to pop? I spent an evening killing his PHer (520, -660, -220) along with the other Avatars. By the time I stopped, Suffering and Agony had spawned easily, but Pain and Anguish both eluded me. Well, I zoned in today to find Anguish was already up. Took the loc, killed him, and now working on Pain. So yes, The Avatar of Anguish does still spawn, and in the exact spot all the other posts mention. Spawns in the six-room "death pit" due East of the Avatar of Agony's spot. 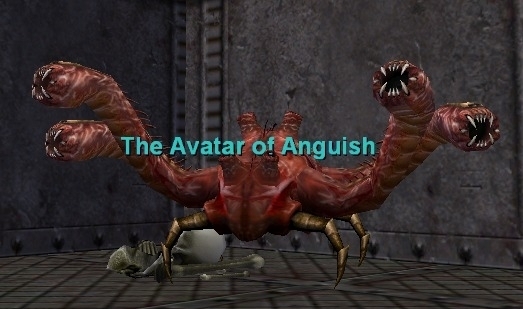 This Avatar spawns in the NW room of those six, Construct of Anguish is the PH. The main hall was easy to split with pacify. To get the Avatar you should be able to pacify the mob standing in the middle western room, open the northern door, bind sight the mob you pacified, bind sight the Avatar, and pacify everything you can see. Then pull the Avatar out no problem. This mob is immune to slow. This mob enrages at around 10% health. This mob is not hard and was easily dropped along with the pained golem by a group of 5 65th lvls (2 beasties 1 monk 1 warrior and 1 shammy). This mob spawns as per the info given by Artaxerius. The information about the spawn spot above is correct. NW room in the eastern "house". Two spawns in the room, and one will aggro from outside if not careful, so if you can get to the room the camp is easy and boring, doable for a tank and healer. I did it with shaman, tried to slow and it took hold however mitigated. "You spell was mostly successful". So he's slowable. I've followed these directions, and so far i've racked up 40+ hours camping this one orb...all of the other have spawned within 2, 3 cycles. can anyone give me a definitive loc, so my guild doesn't shun me for leading them on another torment raid? This one spawns on the death pit. From zone in you go pass the first bridge, go left and follow it til you get to the death pit. He spawned on the right first room. Cleared the 2 pats in that area and cleared the 2 that is at the entrance to the death pit. Then moved the group down and had the monk pull the room, peeled and blew it up. One thing that helped a lot is we used pacify on the mobs visible on the pit so when the monk pulled past them they didn't aggro.